Clodius Macer was the Pro Praetor in Africa at the time of Nero’s fall. Initially, Clodius is said to have been little more than a pirate who raided the North African coast. Clodius attempted to broaden his powerbase by cutting into the grain supplies from Africa to Rome. By April of 68 AD, Clodius decided against supporting Galba in his bid for the throne. By June, when Nero died, Clodius began striking coins in his own name and portrait. By October, Galba had solidified his power in Rome and ordered the of Clodius Macer. 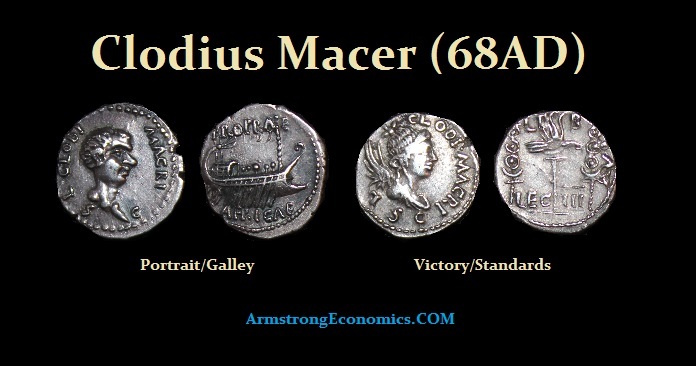 The Coinage of Clodius Macer is clearly of a different style than the coinage normally issued from Rome. The styles are certainly more barbaric in execution indicating that the skilled labour for die cutting tended to reside mostly in Rome. 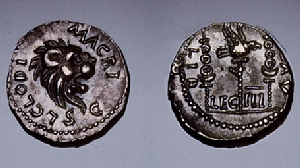 All of Macer’s coins are extremely rare, with fewer than 85 coins of all types known, of which fewer than 20 are portrait types.